The output RPM may be adjusted mechanically without alternating the center distance. This is done by using dual speed change pulleys within the housing. The pitch diameter is altered on the V-belt pulleys, thereby varying speed. The durable cast housing includes mounting lugs for ease of installation. Optional add-ons include: motor, speed changer, electromagnetic clutch and brake, and also a reducer. Contact Miki Pulley for more information, or request a quote today! The ANW model combines a motor and worm reducer, complete with an ANS pulley. There are many configurations available, including horizontile & vertical mounts, as-well as different shaft input and output locations. Motor output range of 0.2kW to 3.7kW (4 pole) with transmission ratio of 1:4. 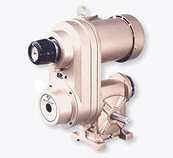 Reducer ratio range of 1:10 – 1:60 are available. The ANW model combines a motor and co-axial reducer with the ANS pulley. This unit is maintenance-free due to the un-lubricated construction of the co-axial reducer. 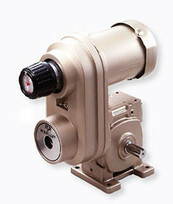 The motor output range is 0.2kW to 1.5kW (4-pole), with a reducer ratio available between 1:5 – 1:80. The ACW model consists of an electromagnetic clutch and brake, motor, and worm reducer complete with the ANS pulley. This compact design has the clutch mounted on the driven side speed change pulley, and the brake mounted on the worm reducer input shaft. This combination produces an optimum output RPM speed. Start / Stop positioning, inching, or intermittent operation is easily performed. Available motor output range: 0.2kW to 3.7kw (4-ploe) with transmission ratio of 1:4, and a reducer ratio range of 1:10 – 1:60. The ANB model contains of an electromagnetic clutch-brake unit, motor, and the ANS pulley. This combination allows frequent start / stop, positioning, inching, or intermittent operations. 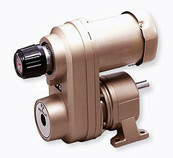 Available motor output range: 0.4kW to 1.5kw (4-ploe) with transmission ratio of 1:4. The PDS model functions by turning the dial on the motor side speed change pulley. The machine side pulley will change pitch diameter in kind. This does not come with a cast enclosure, which enhances versatility and ensures easy installation. There are 6 sizes available ranging from 0.2kW to 3.7kw (4-pole) of transmission capacity. The PDC model is a non-stage unit that functions by turning the dial on the motor side. The machine-side pulley will change pitch diameter in kind. This does not come with a cast enclosure, which enhances versatility and ensures easy installation. There are 6 sizes available with motor output ranging from 0.2kW to 3.7kw (4-pole). The PDG model is a no-stage speed change unit combining a PDS speed changing device with motor and worm reducer. Motor output of 0.2kW to 3.7kW range is available, with reducer ratio range of 1:10 – 1:60. 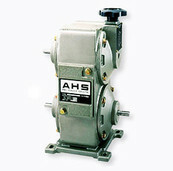 The AHS series is a baseline unit that may be customized with electromagnetic clutches / brakes, motor, or belted speed-changing devices. This unit may be mounted between machines, or between a motor and machine. It may be connected to two machines, given it has through-shaft output available for connection on both ends. Complex operation such as high-frequency starts / stops, or inching may be achieved. Users may select the appropriate configuration given their specialized application. The AHM series is a baseline unit that may be customized with electromagnetic clutches / brakes, motor, or stepless belt type speed changing devices. This unit may be mounted between machines, or between a motor and machine. 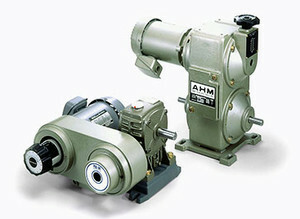 The AHM comes complete with motor and speed changing device. It may be connected to two machines, given it has through-shaft output available for connection on both ends. Complex operation such as high-frequency starts / stops, or inching may be achieved. Users may select the appropriate configuration given their specialized application. There are 6 sizes available ranging from 0.2kW to 3.7kw (4-pole) motor output.